recROC Merit Badge counselors will guide Boy Scouts with blue cards through the Personal Fitness Merit Badge requirements using the unique performance fitness opportunities at recROC. A minimum of 12 weeks is required to complete the badge program, with an initial, final and several scheduled check-in points at recROC with program instructors/trainers/or counselor. Explore our Badge Programs, or register recROCinfo@lititzrec.com, 717.874.3281. Book a party or outing at recROC for your Boy or Girl Scout Troop! 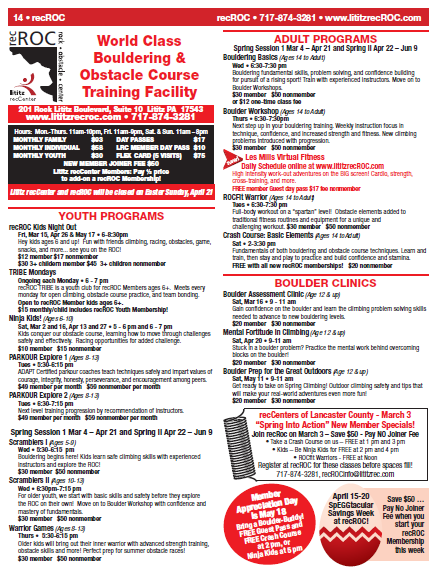 Bring chaperones and set scouts free to explore our Boulder and Obstacle course. Contact recROC for details, or complete a RESERVATION REQUEST online!